Click on each question to view the answer. Click again on the question to close each answer. Over the years, our Association has identified many concerns regarding various issues pertaining to our industry. Here we will endeavor to address these concerns by providing answers to frequently asked questions. Q. Does Redclaw crayfish farming use up a lot of precious water? A. No. We really only have a loan of the water. Some water is lost to the atmosphere due to evaporation and contributes to rainfall. By regulation, water drained from ponds is contained in a catchment dam then used for irrigation or recycled back into ponds. Redclaw farming is recognised as a “Zero Discharge” operation und thus avoids many restrictive regulations. Q. Do Redclaw crayfish farmers use a lot of dangerous chemicals? A. No. Basically all that is put into Redclaw crayfish ponds is Redclaw crayfish and water. No dangerous chemicals, additives, hormones or the like are used in Redclaw crayfish farming. Q. Is Redclaw crayfish farming a source of noise and visual pollution? A. Redclaw crayfish farming is one of the quietest of rural pursuits – after all the Redclaw crayfish is a very quiet animal! Certainly pumps and aerators are used, but a noisy pump does not make a noise for very long. Farms are set out geometrically with services underground, the result being pleasing to the eye. Q. Does Redclaw crayfish farming impact on heritage areas, wetlands and the like? A. Site selection plays an important part in the success of a redclaw crayfish farm. Redclaw crayfish are fresh water animals therefore coastal wetlands are to be avoided. Ideal soil type is hard clay, therefore farms are not found in areas of fertile soil and lush vegetation. Q. Does Redclaw crayfish farming cause competition for native animals? A. Any escape of Redclaw crayfish into the wild is prevented by fences, screens etc. In fact the catchment dam provides a recreational area for native animals. Q. Is it true that there is an infestation of Redclaw crayfish in water impoundments throughout the state and that they have a detrimental effect on native fish stocks? A. Redclaw crayfish farms must be constructed so as to prevent the escape of animals into the wild. It is a fact however, that many impoundments abound with Redclaw crayfish much to the delight of recreational fishers. At this time there is no evidence that Redclaw crayfish have an impact on population of native species. Q. We have heard the term “effluent water” used – does this mean water drained from a pond is a health risk? A. The term “effluent” is an unfortunate choice of word. We prefer to use the term “pre loved water”! Any being, including Redclaw crayfish, needs a healthy environment to thrive, which in our case is healthy water in our ponds. It is obviously in our own interests to keep our pond water in top condition. A. No. We really only have a loan of the water. Some water is lost to the atmosphere due to evaporation and contributes to rainfall. By regulation, water drained from ponds is contained in a catchment dam then used for irrigation or recycled back into ponds. Q. Isn’t all that water a breeding ground for mosquitoes, especially the disease carrying Aedes aegypti? A. A crayfish pond is a “live” body of water which contains various species of organisms that prey on mosquito larvae. Mosquitoes are more likely to be found breeding in pot plants around the home. Q: Is disease an issue with Redclaw farming? A. It has long been proclaimed that Redclaw farming is free of disease problems. This is a blasé statement, as all animals including you and me are subject to disease. However, it is true to say that the Redclaw industry has not been routinely plagued with sweeping outbreaks of disease that have annihilated farmed Redclaw populations. The current (2015) RIRDC research project is investigating incidence of mortality at various stages of the farming cycle, and is looking hard at the ramifications of hitherto undetected infections. Your farm should be designed so that unwanted, wild crustacean and other aquatic animals do not enter your ponds etc. 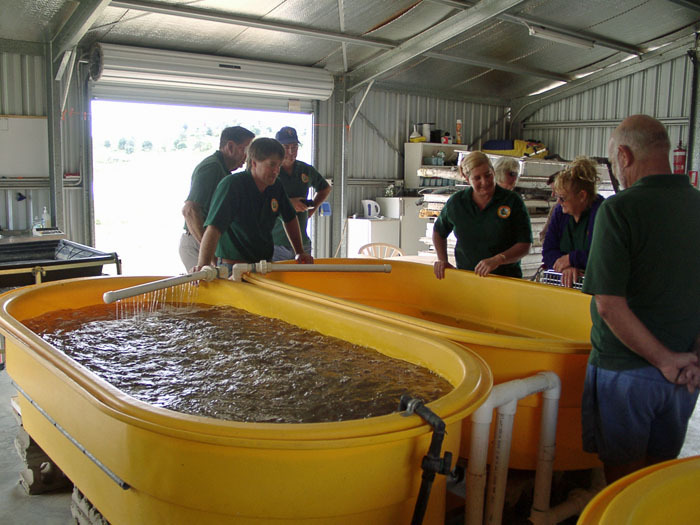 Use disease-free crayfish juveniles to stock your farm. Keep the different ages of crayfish separate and always work with your youngest stock at the start of the day before moving to the older crayfish. “Separate” means separate equipment and nets etc. but if you need to share nets, for example, across the farm always disinfect them between uses in different parts of the farm. Maintain all tanks, ponds, net cages, walkways, drains, nets and equipment in a clean condition, free from biological and contaminated matter, at all times. Ensure there is adequate water exchange and, or aeration to optimise water quality for your crayfish. Keep your feed fresh by storing it in a cool place. Monitor your crayfish regularly so you quickly detect any water quality or disease problem. Keep good records about your crayfish. Remove dead and unwell crayfish as soon as you see them. Dispose of these properly, for example buried with a layer of hydrated lime over the carcases. Contact the Department of Agriculture and Fisheries (or appropriate authority in your state or territory) if you have unexplained deaths or disease. Obtain assistance to get a diagnosis. Quarantine affected pond(s) or tank(s) to stop the spread of any potential infection. Q: Where do I get information on such things as, where and what size property to buy? How much water will I need? Do existing farmers support new industry entrants? What is the start up cost? Where do I source equipment? A. All this information and more is in our book “Redclaw Farming – Getting Started”. Q: How can I get a copy of “Redclaw Farming – Getting Started”? A. Simply email info@queenslandredclaw.org with your request and an order form detailing all our merchandise will be sent to you. Q. What is involved in getting approvals and licenses for a redclaw farm? A. The approvals process can be tricky and frustrating. It involves DAFF, environmental departments and your local council. QCFA has developed a guide to simplify this task which will be added to the ‘Getting Started’ book as an addendum. Otherwise it is available by applying to info@queenslandredclaw.org. Q. When I grow all these Redclaw crayfish, will I be able to sell them? A. This a common question and hard to answer in a few words. Small or beginner farmers must be careful not to establish a market that they cannot supply consistently and thus give the industry a bad name as being unreliable. Another trap for new farms is to inadvertently undercut a fellow farmer that has been supplying the customer for years. Sydney Fish Market is always there as a market, the price has been very good, but is uncertain and fluctuates with supply as it is an auction. Export opportunities come up regularly but normally are too large for any farmer to handle. Chefs these days are more adventurous and local restaurants, pubs or seafood wholesalers in your area can generally be turned into a market. Overall, marketing has never been a serious issue with the industry, but managing how you market your product is. Redclaw crayfish is an accepted part of an established seafood market contrary to such industries as alpaca’s where markets had to be built from scratch. May 2015 update: Over the last few months there has been an increased awareness of redclaw by the restaurant sector, with enquiries for substantial regular supply at good prices becoming common. Q. What with, when and how much do you feed Redclaw crayfish crayfish? The following answers to these questions will be based on the best knowledge available at this time, but be aware that the results of the current research project could well require this information to be updated. What to feed: Most stockfeed producers make what they call Redclaw crayfish pellets most of which are adequate. Grains with high protein content such as soybean and lupins have proved to be a reasonable feed. How much feed: Experienced farmers are guided by the water color to gauge feeding quantity. A more sure way of monitoring feed quantity is the use of small feed trays employed fortnightly in each pond. May 2015 update: The Feeding and Nutrition reseach project is nearing completion. By the end of 2015 the resulting feed will be available from SQ and NQ feed mills making the feed under license to QCFA and will be clearly branded with the QCFA logo. Q. Does the industry have a centralized marketing organization? A. A few have been tried over the years but all have failed due to various factors such as unreliable supply. There is no doubt the industry would prosper under such a system, and is one of the opportunities that will evolve as the industry grows. Q. Do farmed Redclaw crayfish have a bland or muddy taste? A. NO! Farmed Redclaw crayfish are held in a post harvest clean water purging operation which makes their taste, tenderness and appearance superior to wild caught animals. Q. There seems to be conflicting information available regarding farming Redclaw crayfish. A. A lot of the information published in the early days is out of date in the light of industry advancement in recent years. This website contains the latest advances. Q. Has any exploration into the feasibility of a large scale redclaw crayfish operation been undertaken? A. Yes. The DPI contracted a private consulting firm to compile a Scoping Analysis on that very subject in 2005. It was completed in 2006 and may be viewed by clicking here. The industry supports the concept of this report in principle and would welcome it being implemented. It will become obvious to anyone studying this website that many of the statements and recommendations made in the report are out-dated, not only in time (eight years old), but by the progress the industry has made. It is felt that the accuracy of some of the assumptions that support the financial model are in question and the outcomes predicted by the model should be treated with caution. The industry is currently in discussions with the consultant in an effort to get the report rewritten – watch this space! 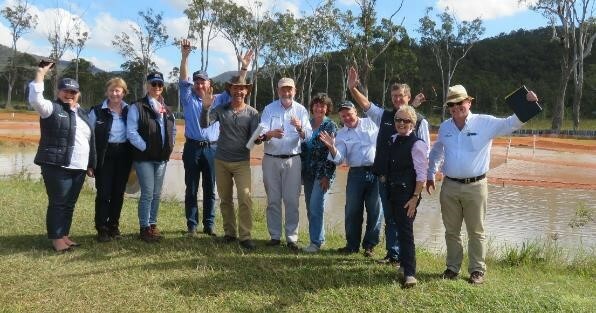 May 2015 update: Recently there has been a lot of interest from Government in the feasibility of aquaculture in Northern Australia – this project may soon have to be moved off the back burner! Q. Is Redclaw crayfish farming a profitable business and where do I start? Q. Are there any existing farms for sale? Q. What have been recent advancements in the industry? Q: How are redclaw research projects funded? A. The Rural Industries Research and Development Corporation (RIRDC) has been a strong supporter of our research program. The industry has to be willing to help itself, both financially and with in-kind support. To this end, we have initiated a research levy on the new feed and Stage Three Juveniles. This way every one using the feed or buying S3J will contribute a small amount to the research effort. Q Where do I find out about the biology of redclaw crayfish?